If you want something slick and stylish like Kailis Bros Leederville is, yet a CBD rendition – the Heritage is a bit of a jack of all trades when it comes to fine restaurants. It comprises of the brasserie, bar, boardroom and bobeché, all coming together to serve different needs. Whether you are a couple sharing an evening out, organising a business dinner, some friends having after-show drinks or planning a larger event, The Heritage has what you need. Although most parts of the restaurant need no introduction, the bobeché deserves special mention. It is a unique 20s carnival bar featuring simple food to complement fine wines, beers and old world cocktails. While most of The Heritage is open from 11am to 11pm, the bobeché is open from 4pm to midnight (to 2am on Fridays and Saturdays.) The entire establishment is closed on Sundays and public holidays. The menu is chock-a-block with grand dishes. Start with a seafood platter or any of the salads or starters. If you’re on a budget, the fixed price menu might be the thing for you. There are many creatively excellent dishes on the main dish menu. There are sandwiches if that is what you prefer today. For afters is an impressive selection of tantalizing desserts, a cheese board and a spectacular array of drinks. 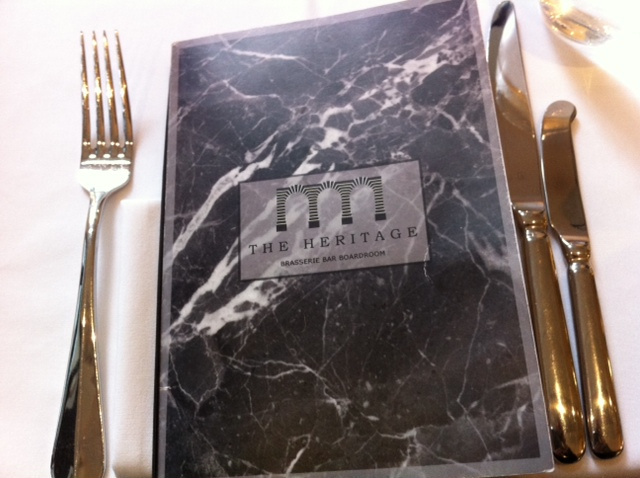 No matter what your needs, The Heritage can give you the fine dining experience you have been looking for.